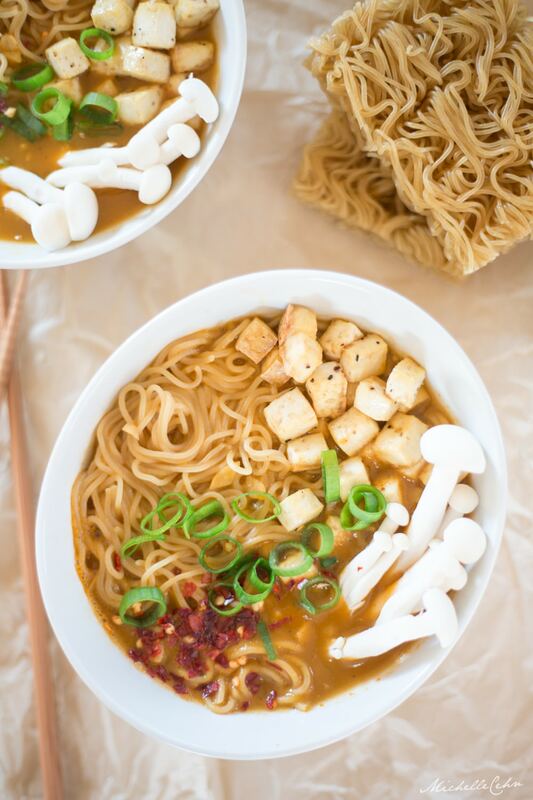 Easy Vegan Ramen Noodle Soup - With Baked Tofu Cubes! 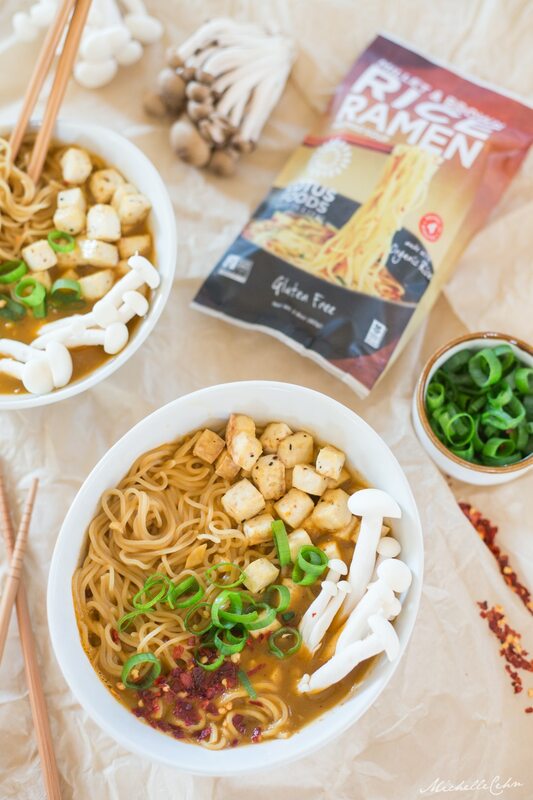 This delicious vegan ramen recipe was generously sponsored by my friends at Lotus Foods. They make some of my favorite healthy ramen noodles made from brown rice. Enjoy! Ramen noodle soup is such a versatile comfort meal. 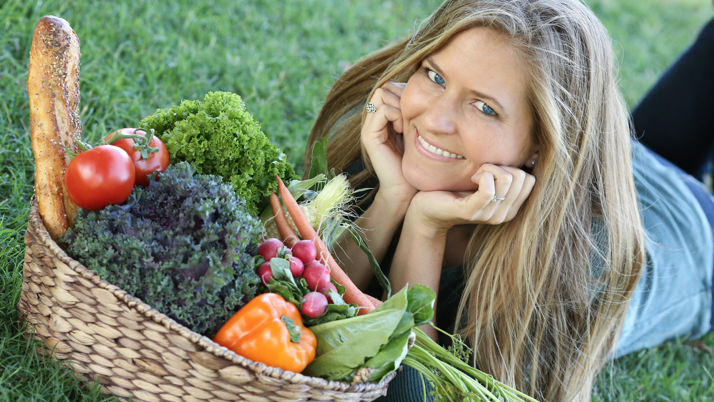 It can be simple and inexpensive, or you can make it fancy and jam-packed with colorful vegetables and flavors! 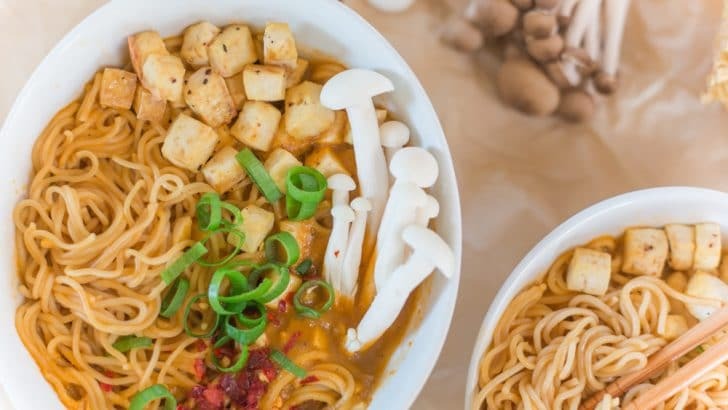 This easy vegan ramen is the best of both worlds. It’s simple and easy to make, yet healthy and seriously delicious. 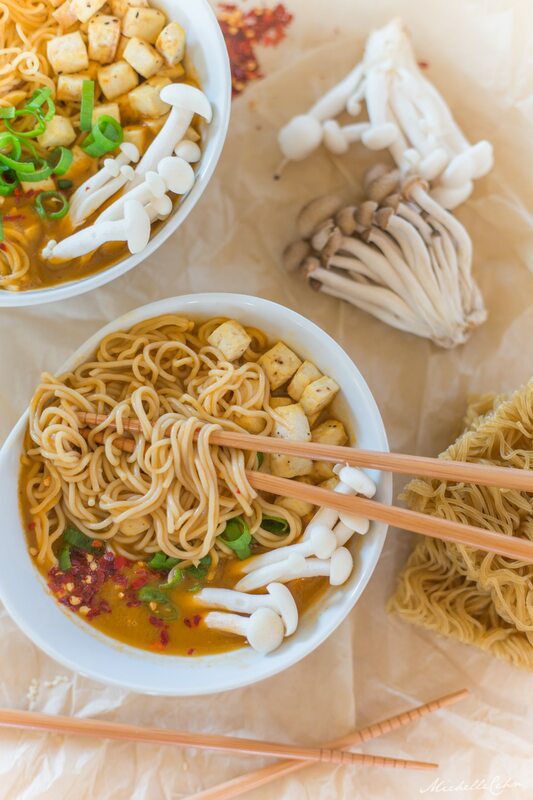 This ramen noodle soup is the perfect base recipe, containing tofu and veggies, and you have the option to add any additional flavors and toppings you’d like. 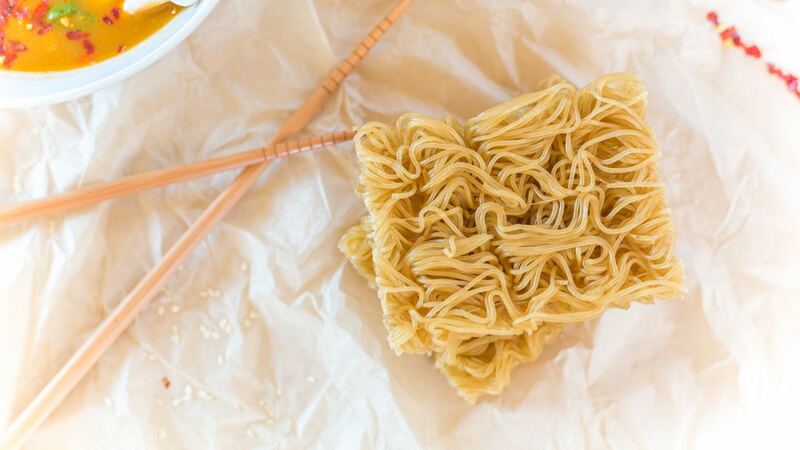 There are endless ways to make ramen noodle soup, so get creative and make it your own! The method is very simple. First, you will season the tofu and bake it in the oven for 20 minutes. While the tofu is in the oven you can prepare the soup. Quickly saute garlic, then add the vegetable broth and veggies. Next, add the ramen noodles and seasonings. When the tofu is finished, put everything in a bowl and top it with additional ingredients if desired. It’s seriously that simple to make an incredible bowl of easy vegan ramen. Instant ramen is such a nostalgic dish. Whether you have memories of being a college student making instant ramen, or you remember this dish from childhood. 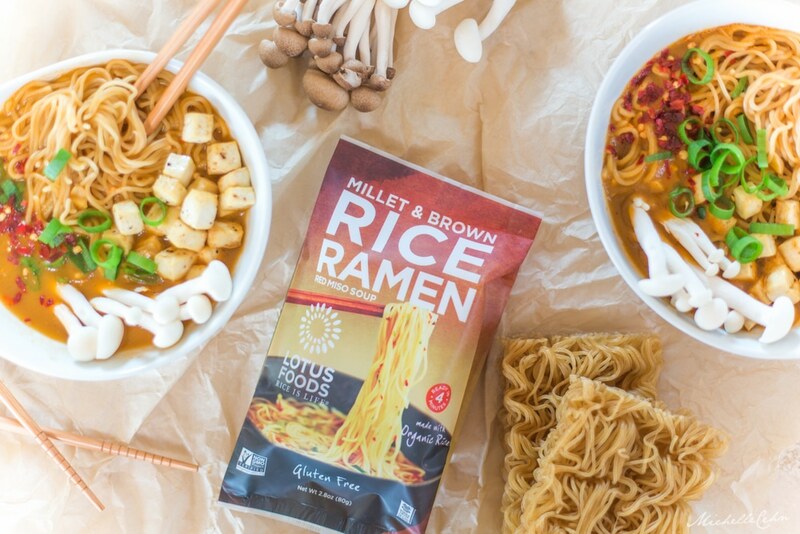 Wait… Ramen That’s Actually Healthy? Instant ramen is usually filled with highly processed and chemical ingredients such as MSG. Aside from that, there is little to no nutritional value with instant ramen because it lacks vegetables and protein. If you’re looking to enjoy this classic dish but in a healthier way, simply choose healthier ramen noodles! 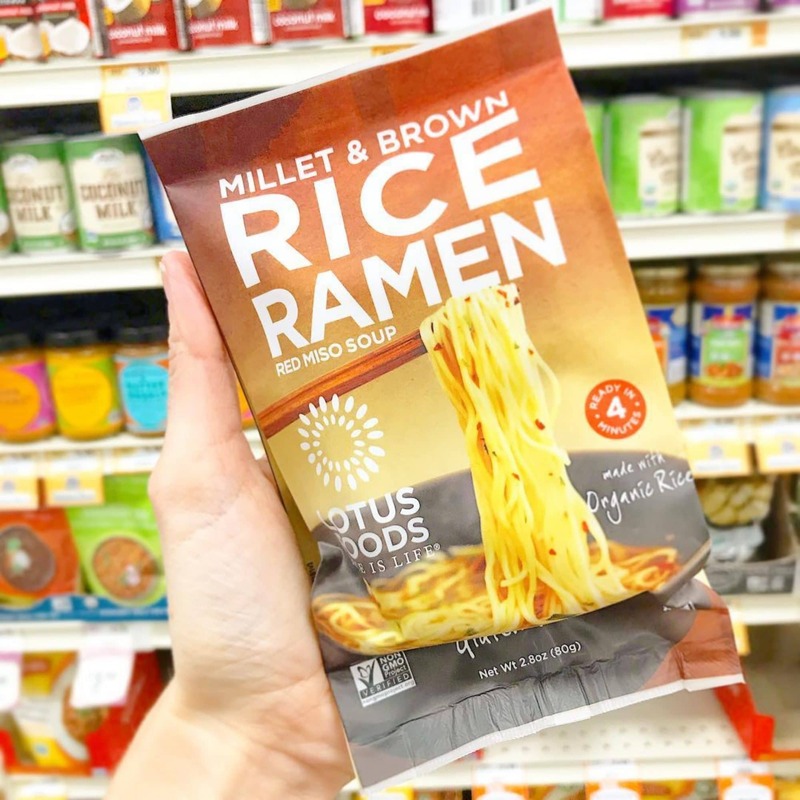 We love these brown rice and millet noodles from Lotus Foods. These noodles are made from just two ingredients: organic brown rice flour and organic millet. I don’t know how they do it, to be honest, because the noodles taste amaaaazing! And good news if you eat gluten-free, because you can still have this dish. 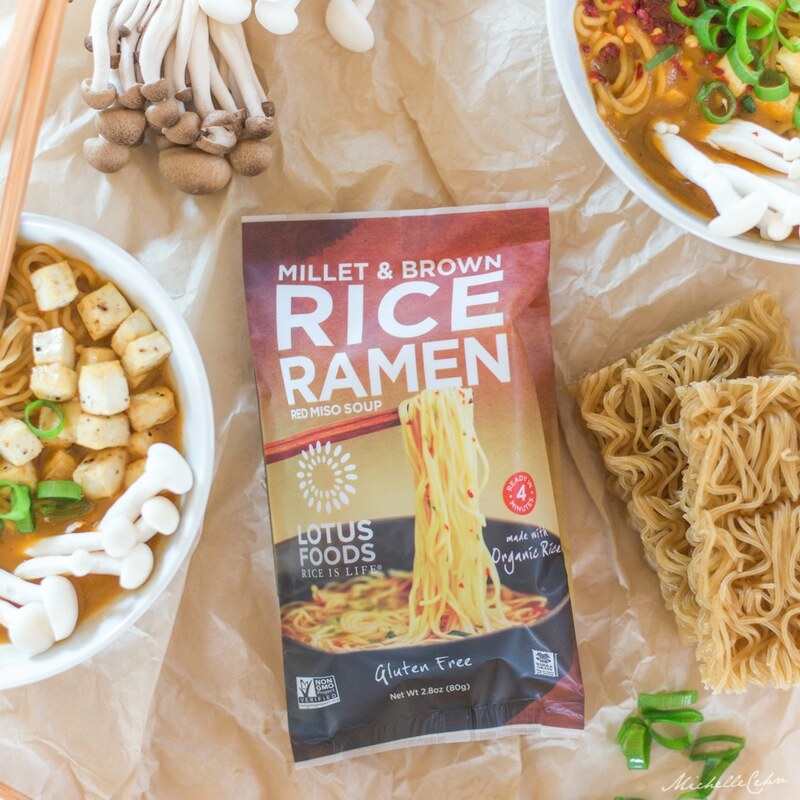 The Lotus Foods ramen noodles are naturally gluten-free. If you are looking for instant ramen, however, Lotus Foods does have ramen noodles with flavor packets to create your own instant ramen! If you’re not using the seasoning packet and you’re making your ramen from scratch, like with this recipe, I highly suggest using a nice flavorful vegetable broth. I find if I make this recipe with a broth that is a bit bland, the soup overall needs more seasoning. This easy vegan ramen recipe serves one, but please feel free to double, triple, or quadruple the recipe if you feel so inclined. If you do make multiple servings, we recommend consuming the soup the same day rather than storing leftovers. The noodles will absorb quite a bit of the broth by the next day. If you’d like to make a big enough batch for leftovers, however, you could skip adding the noodles and just make the soup. When you’re ready to have a serving of ramen, you can boil the leftover soup and add the desired amount of Lotus Foods ramen noodles and boil it for around 5 minutes. Enjoy this healthy and delicious easy vegan ramen! 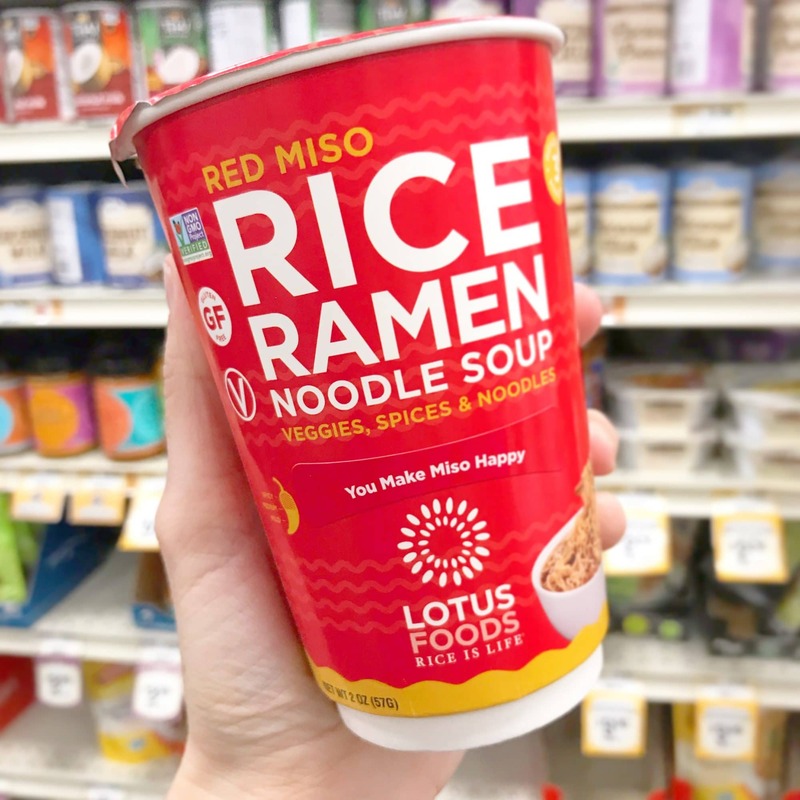 It's packed with veggies and tons of flavor, and uses Lotus Foods gluten free rice ramen noodles! Start by preparing the baked tofu cubes. If you'd prefer to skip this step, you can use raw cubed tofu instead or leave it out altogether. Combine the cubed tofu, sesame oil, salt, and pepper in a bowl and toss to coat. Place the tofu in a single layer on a parchment lined baking tray. Bake the tofu for 10 minutes, then flip it and bake for another 10 minutes. Heat a medium sized pot and add 1/2 of a teaspoon of sesame oil (or olive oil) and the garlic. Saute for 2 minutes. Add the vegetable broth and bring the pot to a boil. Add your veggies of choice (see suggested veggies add-ins and create your own combo) and simmer for about 3-5 minutes, until veggies are cooked yet still crisp. Add the ramen noodles and simmer until the noodles are cooked, following the cooking time noted on the package. Remove the pot from the heat. Add the soy sauce and sriracha and adjust to taste. Pour the soup into a bowl, add the baked tofu, and sprinkle with green onion and red pepper flakes. Serve with any additional toppings and add-ins if you desire. Have Fun With Ramen Add-Ins! If you’re like me and you like to get creative with your ramen, here is a list of possible toppings and add-ins that you can include with this recipe. We’ve included the basic veggies in this recipe. 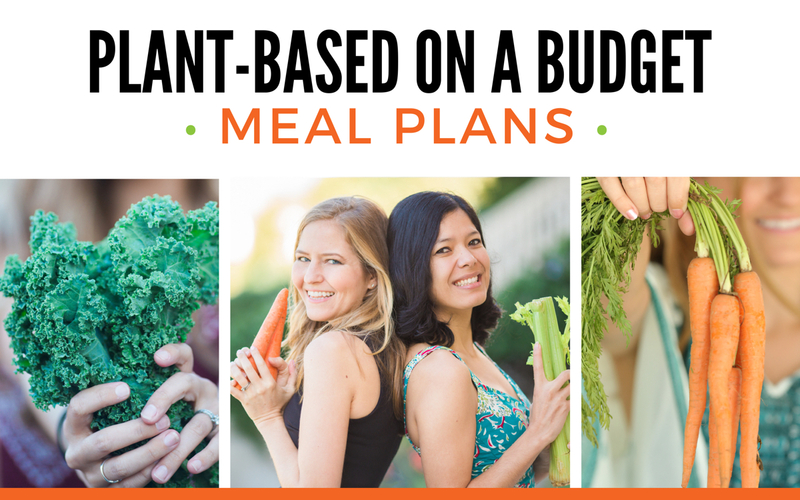 You can swap some veggies out or include additional vegetables if you prefer. 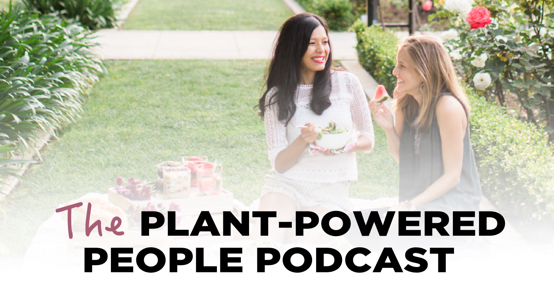 Some wonderful options include kale, thinly sliced bell peppers, green peas, sugar snap peas, edamame, and shredded cabbage. Edamame is a great option if you want to increase the protein content! Miso is a fermented soy product that is very healthy because it contains probiotics and it’s very nutrient dense. It adds a really nice flavor to any ramen dish. If you want to add this to your dish, whisk it in with the vegetable broth before adding the veggies. We love adding black sesame seeds or white sesame seeds to the ramen at the very end. It adds a really nice flavor as well as additional minerals like calcium. Dried seaweed is another great way to increase the mineral content. Seaweed is loaded with essential minerals and it adds a nice flavor and crunch as well. Nori (the same type of seaweed you would use for sushi) is a really delicious option. Add it right at the end so it doesn’t get soggy. Kimchi is a delicious add-in for ramen. It adds fantastic spice and flavor if you like heat. Kimchi is loaded with probiotics and it’s an excellent health food all around. It kicks up the flavor of any ramen soup big time! Pickled ginger will create a similar flavor profile as adding kimchi. If you love pickled foods, pickled ginger is wonderful in Asian cuisine! We use sriracha in this recipe. But if you prefer another kind of hot sauce, feel free! If you don’t like spice, you can leave it out completely but the flavor will be very different. In this case, add more soy sauce/tamari to taste. Traditional ramen often has meat. If you fancy this type of ramen soup, feel free to source some vegan pork or beef as an extra special add-in! Bean sprouts are another really yummy option, especially if you want to add a bit of crunch. Pea shoots are a really nice option if you want to add a really fresh flavor. Cilantro isn’t always the most popular herb, but if you love cilantro like us, we love adding it to ramen. Add it as a garnish to your bowl at the end. Hungry For More Vegan Soup Recipes? Photos by Michelle Cehn for WorldofVegan.com. 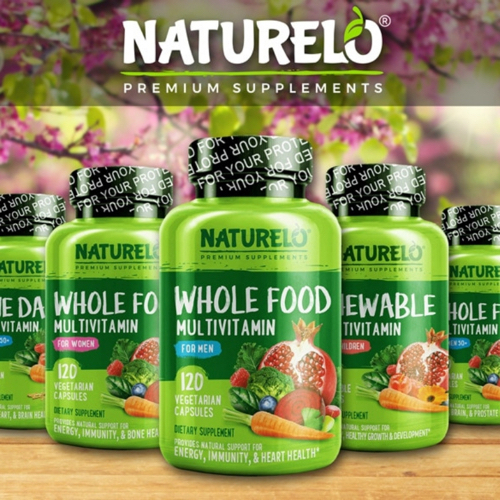 Please note that this article contains affiliate links which means shopping through them helps lights on at World of Vegan. Many thanks to Lotus Foods for supporting this recipe and our work at World of Vegan!